Ace Praia de Botafogo Suites i Rio de Janeiro, Brasilien: Reservér nu! Ace Praia de Botafogo Suites is located in front of Botafogo beach. Ideally located 1 km from the Sugar Loaf Mountain and Copacabana Beach, Ace Praia de Botafogo Suites offers free Wi-Fi throughout and air-conditioned rooms, flat-screen TV and private bathrooms, the rooms feature clean décor and provide guests with bath towels and bed linens as well as blankets. All rooms also come equipped with a minibar, microwave and coffee machine. 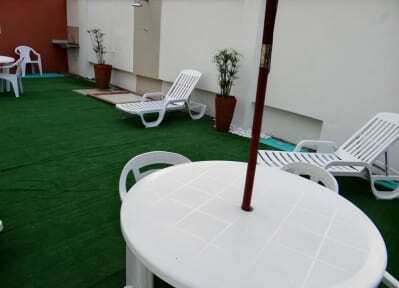 The property is ideally located in Botafogo. Guests can find a supermarket and a host of lunch and dining options within a 3-minute walk. The property is set in a region with easy access to public transportation. The closest Subway Station, Botafogo, is just 30 steps away. Maracanã Stadium can be reached within a 15 minutes’ drive or by tube. Santos Dumont Airport is 3 km from Ace Praia Botafogo Suites. Shuttles to the airport can be arranged at a charge. Ace Praia de Botafogo Suites offers comfortable private rooms for 2 people and large family rooms up to 6 people. Perfect rooms for small groups and families. All rooms have private bathroom. Please note: the property accepts payment in Euro, Dollar and Pound. Please note that Ace Praia de Botafogo Suites does not have a reception desk. The reception is located in the building next door, and must be accessed via stairs. Please note that guests at Ace Praia de Botafogo Suites need to collect the keys at a nearby location. The property will contact guests after reservation in order to give instructions to check in.